I love discovering new brands of shoes that make soft and flexible options for babies and toddlers. Baby T recently received the Chooka Boot from Rileyroos, makers of flexible sole baby shoes, and he now wants to wear them every day! I had to hold him captive on their book shelf for photos otherwise he starts running the moment his feet hit the ground. This comfy shoe with a soft sole gives the baby enough traction and flexibility for the ultimate comfort and safety. It's flexible enough for healthy foot development, but sturdy enough for rugged outdoor use. We absolutely love the sole design of Rileyroos shoes and they are definitely a really high quality pair. The laces on this shoe are really stretchy, so it's relatively easy to put on. The only negative I can think of is that Rileyroos shoes only come in sizes up to 24 months, which of course isn't really a negative. I would be thrilled if they made shoes for older children, I would get some comfy soft Mary Janes for almost 5 year old Baby E. In the photos, Baby T is wearing the biggest size they offer at 18-24 months, he will be two in a month and it looks like these have enough room to fit through this fall, winter, and spring. As you can see, the sole is really neat and has a unique design which gives that incredible flexibility toddlers need. Rileyroos has so many styles to choose from, it's so hard to pick one! Perhaps the latest and the cutest shoes are these Mary Jane shoes that I would absolutely love to get if I had a little girl, my girl isn't so little anymore. One of you will win your choice of Rileyroos shoes! I like the flexibility, the fact that they are handmade and the low prices! I love that their shoes are so so cute, but also functional with the soft soles! Thanks for the review! i like that they are soft and look really comfortable for babies first real shoes. especially when they first start to walk, it makes it so much easier for them to get used to. I adore the little turned up toes! They seem European to me. Just adorable! These shoes look really comfortable. My daughter is walking now, and doesn't usually wear shoes, but when we go out to some public places I want to protect her feet. These would be great. I love these cute little shoes! I'm glad they're flexible and give enough traction. I agree, those Mary Janes are so darn cute!! I would love to put those on my little girl!! These shoes look so comfy with the soft sole PLUS they are also super cute. just checked put the site. they have a lot of cute shoes to choose from. the ones you got are really cute!!! i love how comfty they look and the grippies on the bottom are great for little fast ones! 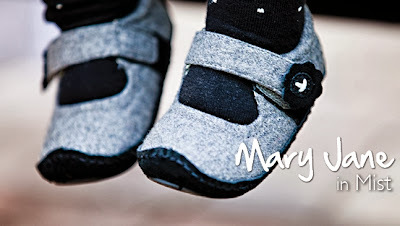 I've been eyeing the Mary Janes in mist for a while now, might just have to scoop them up soon. Love the ones your little guy is wearing too, love orange/brown together. Just perfect! I checked out thestore and there are so many cute shoes! It was really hard to pick a favorite. Very cute shoes from a very awesome company that is offering a fantastic giveaway!!!!! We have used A LOT of really terrible baby + toddler shoes! These look great! They look like they will stay on the child's feet, while providing the support they needs when playing outside. I also love how stylish they are! Thank you for bringing my attention to this brand! They look great. I have to agree with your wish for someone to make a good soft-soled shoe in larger sizes. My children are close in age to yours -- 4yo son & 2yo twin girls. One of the twins is tiny and would easily fit in these, but I always wish I could find similar shoes for the other two kids. Sounds really comfy! I agree- too bad they are only available up to size 24 mths- they are adorable shoes! Your son's shoes are really cute! I love soft-soled baby shoes! I'm pretty sure I would pick the Mist Mary Janes if I won, because they would match my daughter's winter clothes pretty well. She is 9 months now, and already walking along furniture! These shoes look great for early walkers. These shoes are so cute! They also look a lot more comfortable for babies when they are in that pre-walking stage. I would love to get a pair of these for my baby girl due in Feb. I have never heard of these before. They look really comfortable and flexible. These look like great shoes for a child that is learning to walk. I like how they have rubber soles on the bottom. my only issue with these is they don't seem to offer shoes for children with wide feet as my son does. i would love these for my newborn though who has tiny little feet. I love this style sole! My son will be walking in the next 2 months and these would be great! These look like great quality. I like that you pointed out the stretchy laces. It can be so challenging getting shoes on my LO, every little bit helps!